In 2009, a group of concerned individuals and representatives of federal and state agencies, industry, and non-governmental organizations came together in an effort to cooperatively address invasive plants in the state of Tennessee. Their focus centers first on prevention – developing strategies to keep new invasive species out of the state, followed by early detection and rapid response to quickly spot and eradicate these troublesome species. This group, the Tennessee Invasive Plant Species (TIPS) Steering Committee, chose to focus on species that are known to be highly invasive where they occur but 1) do not yet occur in the state of Tennessee or 2) are not yet widespread in the state. Representatives of fourteen entities signed a Memorandum of Understanding establishing a 41,220 square mile Cooperative Weed Management Area encompassing all of Tennessee and an agreement to work together to educate, detect, inventory, monitor, control, and prevent the spread of cogongrass and other designated species within the state of Tennessee. TN-IPC estimated the cost of invasive plant management to the state, surveying federal and state agencies, non-profit organizations, and private landowners on how much they spend to manage invasive plant species in Tennessee: at least $2.6 million annually. This figure represents the minimum amount of money spent in our state on invasive plant-targeted control (biological, chemical, and mechanical), mapping, and outreach, taking into account only direct costs. Indirect economic impact includes invasive species influence on ecosystem services and land value by decreasing native plant diversity, crowding out wildlife habitat, degrading wildland recreation potential, and lowering property values. Estimating the total economic impact of invasive plants is extremely difficult. Nationally, estimates range from $603 million to $25 billion annually ($603 million, Office of Technology Assessment 1993; $25 billion, Pimentel et al. 2005). In 2008, The California Invasive Plant Council estimated that invasive plants cost their state roughly $82 million annually (Brusati 2009). The U.S. Office of General Accounting (2002) recognized that many economic analyses focus on the impacts of invasive species on commercial activities such as agriculture, forestry, and fisheries, rather than on the impact on natural area ecosystems. We focused primarily on the cost of invasive plants on managed natural lands. We sent our survey to nearly 200 agencies and organizations working in Tennessee. Our resulting figure of $2.6 million in expenditures represents the responses received in the survey and is detailed in the fact sheet below. Other invasive plant organizations interested in conducting a similar study, may download a how-to handbook on developing and implementing a cost assessment survey. Invasive Coltsfoot (Tussilago farfara) is inadvertently introduced into Cumberland Gap National Park via gravel for road work. Gravel and sand quarry pits are the perfect disturbed habitats for establishment of invasive plants. Some invasive species are deliberately introduced during restoration of plant cover to control erosion and improve water quality. Seeds from invasive plants can contaminate both the active pit and storage piles, providing a pathway for future infestations at construction sites throughout the region. Adapting forms and procedures in use at Yellowstone National Park, Great Smoky Mountains National Park has begun working with quarries used by the park to survey their facilities for invasive species and recommend improvements to minimize seed contamination. Sample inspection protocols and forms, a list of restoration seed mixes to use and seeds to avoid, plus FHWA guidelines on invasive species are below. During the year, TN-IPC may host one or more workshops or seminars, including our annual meeting, at various locations around the state. These events include topics on invasive plant identification, management recommendations, chemical control, and alternative landscaping options, as well as updates on TN-IPC’s projects and regional and national issues that impact our state. Commercial pesticide applicator recertification points are usually available in several categories. TN-IPC board members are often available as speakers for interested groups. The Council has developed presentations on the general issue of invasive plants, native plant alternatives for gardens and landscapes, homeowners off-the-shelf herbicide application, and mapping of invasive species in Tennessee. PDF files of four slide presentations may be viewed below. To request a guest speaker or to use one of our presentations, please contact us. In 2008, Middle Tennessee State University’s Center for Environmental Education created an activity guide and video on invasive species.Noxious Neighbors: Invasive Species in Our Backyards features 11 classroom activities variously suitable for grades K-12 and includes correlations to Tennessee’s science curriculum standards and a glossary. The video “If It’s Green, It’s Good?” may be used in conjunction with the activity guide. These resources were funded in part by the National Park Service’s Challenge Cost Share Program. Download the video — If It’s Green, It’s Good? If It’s Green, It’s Good? Invasive Species in our Backyards from Margie Hunter on Vimeo. TN-IPC sponsored Invasive Weed Awareness Week in Tennessee (TN-IWAW) as an opportunity to educate the public on this important issue. In 2009, with the support of 47 organizations and businesses in the state, we received a State Proclamation from Gov. Bredesen declaring Feb. 23-28, 2009, our first Invasive Weed Awareness Week. Our supporters organized 12 invasive plant removal projects across the state during that week. TN-IPC sent all information to broadcast and print media statewide. The Second Annual TN-IWAW in 2010 was Feb. 22-27, and we received the support of 58 organizations/businesses. Rep. Kent Coleman and Sen. Steve Southerland introduced bills in the General Assembly for a Joint Legislative Resolution declaring these dates as Invasive Weed Awareness Week in Tennessee. We encouraged our supporters to organize an invasive plant removal project. Today, under the guidance of Invasive Plant Control, Inc., and with help from Garden Clubs of America, Weed Wrangles are being held all over the state, region, and nation as part of Invasive Species Awareness outreach. Find out more about Weed Wrangles in your area. Invasive plant removal events are a great way to involve the community in your organization, introduce them to native plant and animal species in a natural setting, and educate them about threats from invasive species. TN-IPC developed a set of practical steps and guidelines, Organizing Volunteer Invasive Plant Removal Projects, to help you plan an event in your area. Boot brush interpretive sign installed by SACWMP on the Appalachian Trail in Hot Springs, NC. Southern Appalachian Cooperative Weed Management Partnership (SACWMP) developed interpretive signage for trailheads along the Appalachian Trail, installing three in Madison County, NC, near Hot Springs. The signs describe the threat exotic invasive plant species pose to natural areas and picture six common invasive species. A boot brush is mounted at the base of each sign to encourage hikers to scrub mud and debris from their boots before entering the trail. The signs are designed to educate the public to the role humans play in spreading invasive plants. To prove the efficacy of the project, dirt was collected from these brushes, placed in sterile pots, and watered. Seedlings of invasive species, such as Japanese Stiltgrass (Microstegium vimenium), as well as native plant species quickly germinated. The signs accomplish two goals: the spread of harmful species is at least slowed while hikers learn about invasive plant ecology. John Odell of SACWMP, developer of the sign, has provided basic construction guidelines other groups may use to build signs for their area. TN-EPPC can assist with sign text and photos (as shown at right) if needed. Along with the University of Tennessee and Southern Appalachian Man and Biosphere Cooperative, TN-IPC drafted an Invasive Plant Management Guide for homeowners tackling heavily infested property. Strategies for larger scale undertakings will help make the task more manageable. TN-IPC would like to develop planting guidelines for Homeowners Associations in an effort to curb the use of non-native invasive species in planned landscapes and encourage an ecological approach with native plantings. Volunteer efforts and suggestions for this project are welcome by Email. Invasive plants pose a number of ecological threats to natural systems. At their worst, invasive plants alter ecosystem operation and the services provided, decrease native biodiversity, increase risks to threatened and endangered species, and impose a high financial burden for control once they have spread. In addition, invasive plants often necessitate the use of chemical applications, can increase risks to natural areas from storm and fire damage, crowd out native habitats along rights of way, invade a variety of native habitats, overtake and damage structures, open spaces, powerlines, shade trees, lawns, and gardens, and are responsible for a loss of local sense of place and aesthetics. TN-IPC is collecting a comprehensive list of specific ecological impacts, particularly with wildlife. When finished, it will be posted here. Suggestions for this list are welcome by Email. The power of the consumer is an important tool that can be used to influence the plant stock carried by garden centers and nurseries. Businesses are quick to respond to the needs and interests of their customers. TN-IPC has developed a small card gardeners and landscapers can use when visiting their local retail nursery. Simply note any invasive plant(s) carried by the nursery on the card and leave it with the owner or staff. The card states you don’t use plants known to be invasive in Tennessee, notes the invasive species being sold there, and asks the nursery to please consider discontinuing the sale of these plants. On the opposite side is a note inviting the nursery to visit TN-IPC’s Web site and learn more. The Tennessee Nursery Calling Cards can be easily printed and cut (5 cards to a page). Carry a few when shopping for plants. The United States Department of Agriculture recently proposed revisions to quarantine regulations covering the importation of plants for planting (nursery stock). When this quarantine (known as Q37) was first written, plants came to the United States from only a few foreign locations, were imported by nurseries in low numbers as germplasm starter material, and required treatment for pests. National plant distribution was slow. Today, plants from worldwide locations come to the US in unlimited consumer ready quantities, and are treated only when quarantine pests are found. The USDA has proposed a comprehensive review and modernization of Q37 led by the Animal and Plant Health Inspection Service (APHIS). The new proposal created the “not authorized pending pest risk assessment” or NAPPRA category that would help screen plants for their invasive potential. During the open comment period in 2009, TN-IPC submitted a letter of support for this overhaul of Q37. Local municipalities are urged to consider the impacts of invasive species along waterways and roadsides or in parks. Several are examining ways to minimize invasive plants and encourage native plantings. Here are two examples. 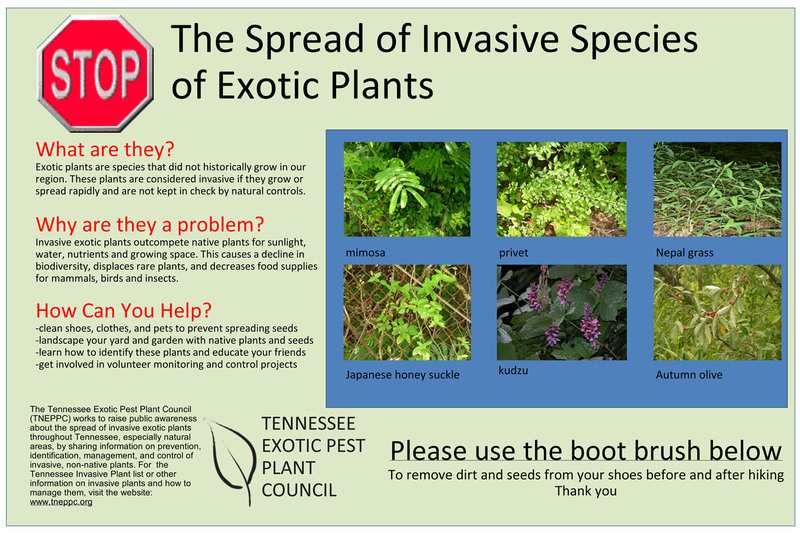 Here are three excellent field guides on the identification and control of many of the invasive plants on TN-IPC’s list. There are many excellent informational Web resources for further research.